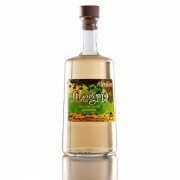 Mistela “Alegría”, produced with the greatest care, is the result of the expertise of the Alcublan heritage. Presented in clear glass. A sweet drink typical of our lands and with a distinctive flavour which is achieved thanks to our oak barrels. Get these 500ml bottles in 6 units boxes. This sweet liquor is suitable to accompany appetizers or to be enjoyed after meals. It is also used for making typical Valencian sweets. Moscatel grape, a sweeter variety which ferments earlier than the rest.